Apdo. 99, 03080 Alicante, Spain. José Carlos was born in Havana-Cuba in 1971 and received his B.Sc. in Chemistry (1994) and his M.Sc. in Organic Chemistry (1998) from Havana University. In 1999 he moved to Spain obtaining his PhD in the Department of Organic Chemistry of the University of Santiago de Compostela under the guidance of Prof. Eugenio Uriarte (2003). 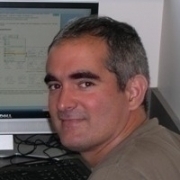 After two years of postdoctoral experience (2005-2006) in Carreira's group at ETH in Zurich, he became "Juan de la Cierva" researcher at the University of Alicante (January 2007) where he was initially promoted to assistant professor (October 2008) and later (March 2012) to associate professor. Dr. González-Gómez has also been research associate at Boston University (2009). His research is focused on the development of stereoselective reactions and their application to the synthesis of bioactive compounds.